In this tutorial, you will learn how to configure JungleMail for tracking on an external site collection. Main site collection - the site collection where EnovaPoint JungleMail Core is activated. It is the site collection from which you will be sending emails. External site collection - the site collection where JungleMail Publishing Web Parts feature is activated. This site collection is used for tracking and subscription features only. Please mind these terms to avoid making changes in the wrong site collection and malfunctioning of JungleMail. 1. In the external site collection, click Site Settings > Add a page. 2. Enter a page name, e.g., Tracker, and click Create. 1. Go to the tracking page and click Edit Page. 2. Click Insert > Web part > EnovaPoint > JungleMail Tracker > Add. 2. Click Edit Web Part. 3. Specify the main site collection location. Select Other Site collection and specify the URL of the main site collection. Provide JungleMail user account credentials to access this site collection. Test the connection to ensure the user can access the site which includes the JungleMail system lists. 1. 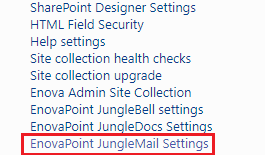 In the main site collection's root site, click Site Settings > EnovaPoint JungleMail Settings. 2. Enter the URL of the tracker page that you previously created. Congratulations! You have now successfully set up JungleMail tracking feature.